earned a reputation as one of Alaska's deadliest highways." Yes, 2016, almost a year after this entry is dated -- because I'm finally writing it in June, 2016. That's how far behind I am on uploading photos and journaling from our Alaska trip in 2015. I found the quote while searching for information about just how dangerous this section of the Seward Highway is. 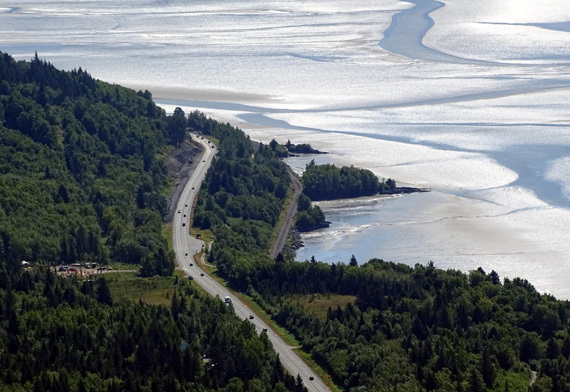 The highway runs from Anchorage to the town of Seward on the Kenai Peninsula. It is the only road connecting the rest of Alaska to the popular peninsula, so traffic is very heavy, especially in the summer months when hundreds of thousands of visitors are present. The most accidents are in the northern half of the highway between Anchorage and Portage where the narrow road winds around Turnagain Arm. I highlighted this part in yellow on the AAA map section above. 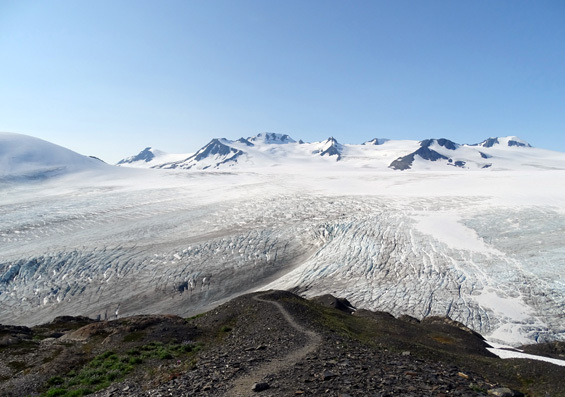 There are many distractions with the scenery -- mountain and ocean views, overlooks to see whales and Dall sheep, parking areas for popular trails and a bike path, several small towns with businesses. There are very few places to pass, especially with so much traffic, and even fewer turn lanes. We've driven this road several times during our two visits to Alaska -- twice out and back with the Cameo, other times on day trips in just the truck. Knowing how busy the road is from Friday to Sunday, with many residents traveling to the Kenai to fish, camp, boat, attend special events, etc., we've mostly limited our trips to weekdays. Even then, impatient and/or clueless drivers are a hazard to those of us trying to stay safe and enjoy the ride. The purpose of this entry is to warn other Alaska visitors about this stretch of road -- not to dissuade anyone from traveling on it. It's well worth driving but you've got to know what you're getting into. 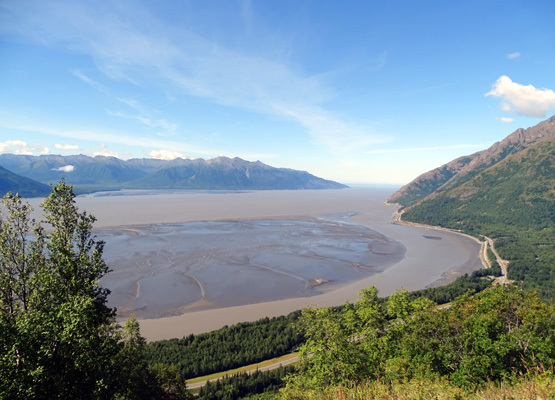 View of Turnagain Arm and the Seward Hwy. from Bird Ridge this afternoon; the tide is going out. The impatient drivers tend to be Alaska residents who either live down there or travel there on weekends from Anchorage or farther north, and people who frequently travel the road for their work (truckers, tour bus drivers, delivery folks, etc.). Even if their livelihoods depend on the hoards of summer visitors, they are usually in a hurry when traveling this section of the highway and they just want to get from Point A to Point B as fast as possible. They've seen the beautiful water and mountains hundreds or thousands of times already so they're more oblivious to the scenery. In the eyes of most visitors, these non-touristy types drive too damn fast, follow too closely, and take too many risks trying to pass slower folks who just want to enjoy the scenery. We visitors are often at fault, too, because we're so fascinated with that drop-dead scenery that we sometimes don't pay proper attention to how we're driving. We might drive well under the speed limit, stop suddenly for a pullout, or underestimate the speed of traffic when getting back on the road. All that irritates the faster drivers, of course! Not much room for a road and RR tracks between the Chugach Mtns. 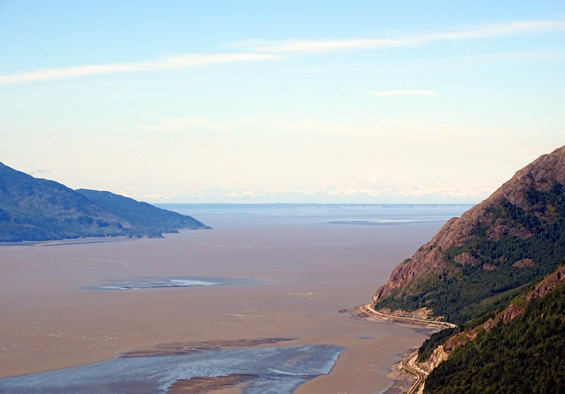 and Turnagain Arm! The tide was low when I took this photo from Bird Ridge early this afternoon. Numerous RVs of every size travel this highway in the warm months and many of them drive slower than the speed limits, not just to view the scenery but to be safe on the numerous curves. It would obviously be foolhardy of them to go too fast or they might end up in the ocean -- but the impatient drivers behind them seem as oblivious to that fact as they are of the scenery. 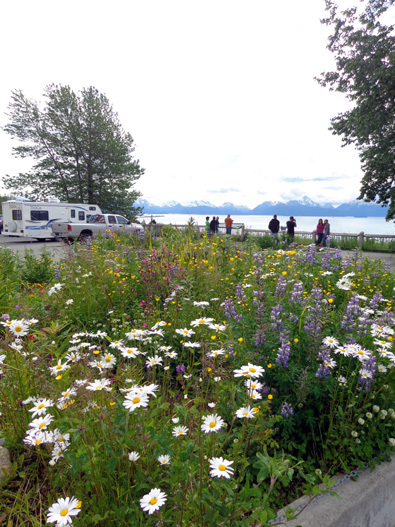 The Kenai Peninsula is a popular destination for both residents and visiting RVers, especially 1) on summer weekends and 2) when the salmon are running -- which is most of the summer. 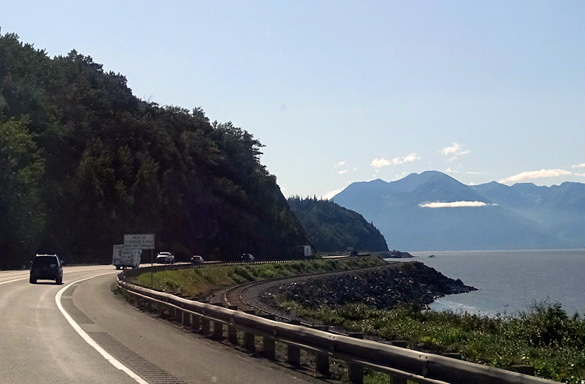 Every day of the week the Seward Highway is traveled by thousands of RVs, tour buses, and other vehicles going one way or the other. 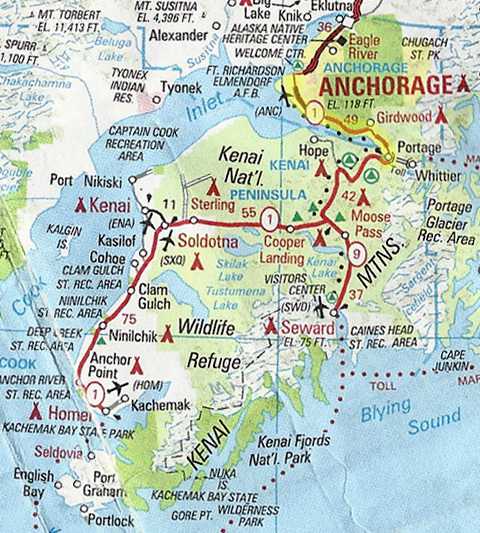 Add in 3) other popular attractions and 4) seasonal events in Seward, Homer, Kenai, and other towns on the peninsula, and you can understand how heavily traveled this highway is by all sorts of vehicles. Because of the heavy traffic we've tried to maintain the speed limit when hauling our 5th-wheel trailer along Turnagain Arm down to Portage Valley, Seward, Kasilof, and other destinations. We've pulled off the road at one or more of the (few) pull-offs along the water to let vehicles pass when several have piled up behind us. And we've mostly avoided driving the road on weekends, even in just the truck. Even so, impatient drivers have ridden our bumper and taken a big risk to pass us on the two-lane highway. 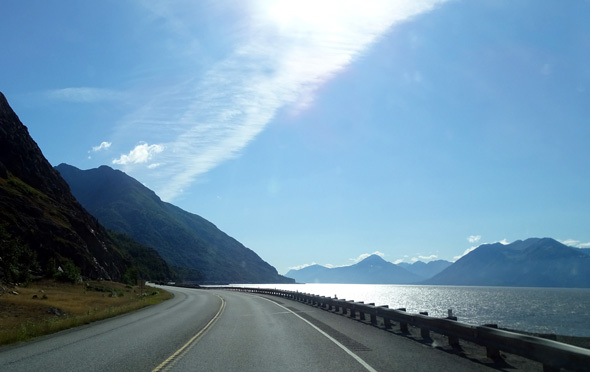 We feel like we're taking a big risk just to drive this section of the Seward Highway. So the tragic event that occurred July 31 near Portage at MP 80 really caught our attention. It could have been us! Part of the reason I was shaken by the wreck is that I heard the sirens from all the emergency vehicles rushing from Anchorage and Girdwood to the scene of the multi-vehicle accident while I was hiking above the highway on Bird Ridge. More importantly, Jim and I can identify with the California couple whose large 5th-wheel trailer was demolished by the tour bus -- and a second driver whose camper was also struck a few seconds later. That hits close to home for us. The RVers are all lucky to be alive and apparently injured only psychologically, not physically. You'll see what I mean when you read the article. It's amazing the first couple didn't get hurt after the bus rear-ended their camper and sent it up and over the truck they were riding in! Jim and I worry not only about being injured in a wreck, but also the ramifications of our RV being damaged beyond repair. This is our only home. We can't just go back to a stick-n-bricks house if our RV is damaged or destroyed. I'm glad this couple has a house in California to return to and hope the second RVer has another place to live, too. Here's the initial Alaska Dispatch News online article from July 31. At the end I'll include another link with photos dated August 1. 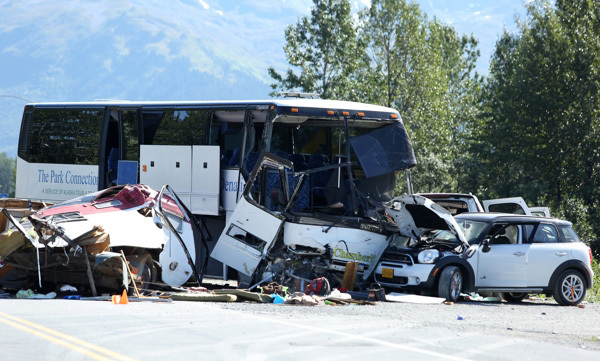 A midday accident Friday on the Seward Highway involving a tour bus and about six other vehicles resulted in one death and at least three critical injuries, according to Alaska State Troopers. A trooper spokeswoman said the Seward Highway was closed at Mile 80 as emergency crews rushed to help the injured and troopers conducted their investigation. Witnesses said the accident sequence began when the Anchorage-bound bus rear ended a pickup and trailer that were slowing for a turning vehicle. The bus rolled into oncoming traffic and was struck head on by a southbound SUV, the witnesses said. The driver of the SUV was killed, a witness said. the white Mini Cooper. I think the camper on the left is the second one that was hit. Troopers in Soldotna got report of the crash at 12:18 p.m. Anchorage Police said the highway was expected to be closed until 7:30 or 8 p.m.
A medevac helicopter and ground ambulances were used to take the injured to the hospital, while a state medical examiner vehicle sped toward the accident early afternoon. Troopers said other people were injured and needed to be transported for medical treatment or evaluation. 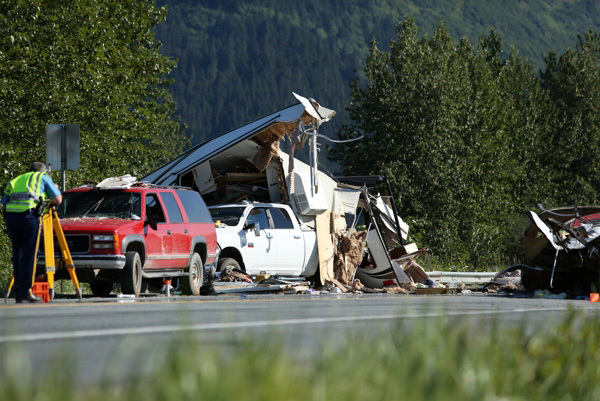 The accident occurred near the entrance to the Alaska Wildlife Conservation Center, at Mile 79 on the Seward Highway. Staff at the center assisted at the accident site. Ken Graves said the chain of events began when he slowed toward the entrance of the wildlife center. Just ahead, in his northbound lane, a Suburban was turning left into the center. The highway has no left turn lane. Graves said he and his wife Kathy had been fishing on the Kenai River. They�re from the San Francisco area and have been on the road for about 2 1/2 months. They were in a pickup and were hauling a big fifth-wheel trailer -- called that because it mounts on a round plate affixed to the pickup bed, not a rear trailer hitch. In an afternoon interview by the wreck, Graves said he had slowed to a near stop when he suddenly saw the bus in his rearview mirror bearing down on him. The bus smashed into his trailer, Graves said. The trailer shot up over the pickup, absorbing most of the force of impact. He said he and his wife walked away from the wreck. Patrick McPherson, from Wasilla, had taken his visiting sister from Texas to the wildlife center and was on the way out of the park when the bus struck Graves�s pickup. McPherson was behind a white Mini Cooper, which in turn was at the stop sign leading to the Seward Highway. McPherson said he didn�t see the bus hit the truck, but heard �a big thud� and the crunch of metal and glass. He looked up and the pickup was already wrecked and the bus was careening into oncoming traffic in the southbound lane. The bus clipped a truck with a camper in its bed, knocking off the camper [my note: that was the second RV involved in the wreck], then collided head on with an SUV with business decals all over it. The SUV was thrown into the Mini, McPherson said. McPherson said he leaped out to help. The driver of the SUV was pinned behind the wheel and bleeding, but the two passengers were able to get out � the woman in the passenger seat and the person in the back whom McPherson believed to be their daughter. He said he helped both get out. They sat by the side of the road. The daughter had cuts on her face. The bus windshield was blown out or shattered. The bus came to a stop diagonally on the highway. Hours later, vehicles were still crashed beside the bus and a red-and-white debris pile from the camper was on the pavement. 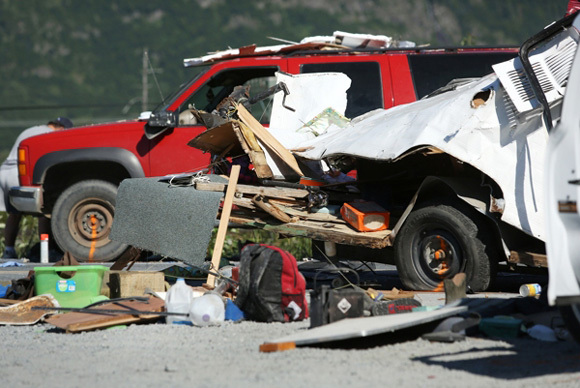 The other camper trailer was still piled on top of the Californians� pickup. �As soon as it happened we rushed over to help out,� added Corey Cowgill. Many others rushed out of their cars, too, said Jessica. �The injuries ranged from really scared to cuts and lacerations,� she said. �A few nurses and EMTs who weren�t on duty but were in traffic ran over and started helping people.� Troopers, the Girdwood Fire Department, and Anchorage police responded to the crash, troopers said. Susan Judd, accounting manager for Alaska Tour & Travel, said the tour bus involved in the accident belonged to the company. 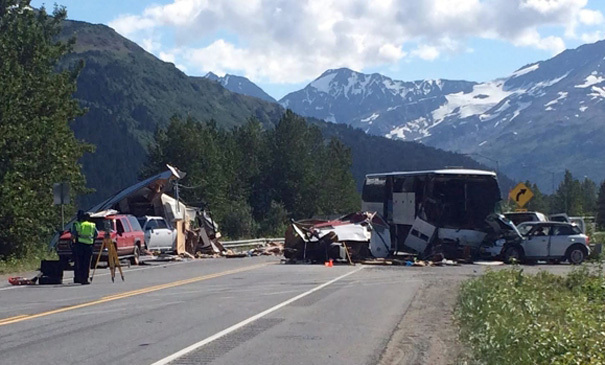 Steve Judd, president of Alaska Tour & Travel, said 42 passengers and the driver were on board the bus when it crashed. 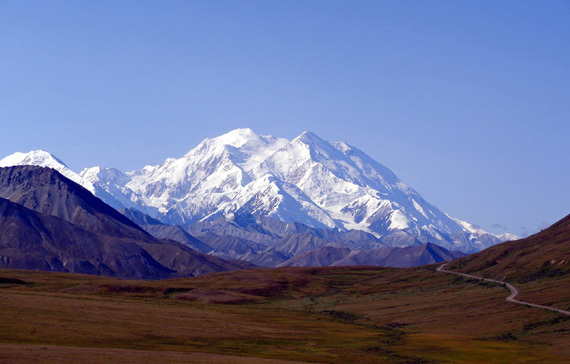 The Park Connection Motorcoach is a scheduled summer bus line service that operates between Anchorage, Denali National Park, Talkeetna, Whittier, and Seward. The Friday getaway traffic jam was already reaching monumental proportions by mid-afternoon, with no relief in sight. Between Mile 84 and 83, south of Girdwood, Ericka Moore was stretching her legs outside of a Jeep mired in the jam. The Jeep had moved all of a mile in some 30 minutes, but she and her friend planned to stick it out till the road re-opened. They, like hundreds of others, were heading toward Salmonfest, the weekend Kenai Peninsula festival in Ninilchik. Mallory Martin was also headed to Salmonfest, but the traffic jam, bright sun and warm air made a side-of-the-road pond too tempting to resist. Martin and two friends jumped into the water for a quick swim. 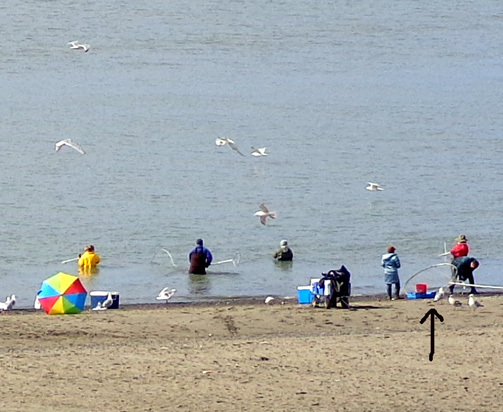 They weren�t too worried about arriving late at Salmonfest, Martin said � the band they were waiting to see was scheduled to play at 11 p.m.
Dip-netters in the Kenai River July 13, 2012; I drew an arrow under one of the large dip nets. The huge jam on the sole highway between Anchorage and the Kenai Peninsula led to a surge in calls to aircraft charter companies. �We're pretty much booked up,� said Hillary Gularte, an employee of Regal Air in Anchorage. �People are calling nonstop.� �It�s flight attendants and families and everyone who's stuck out there that�s got to be somewhere,� Gularte said. Alaska Dispatch News reporters Megan Edge, Tegan Hanlon, Jerzy Shedlock and Suzanna Caldwell contributed to this story. I mentioned at the beginning of this entry that I'm uploading it in June, 2016. Eleven months later I'm still disturbed by the apparent senselessness of this tragedy. I have no idea if the tour bus driver or company was found to be negligent. Was the driver impatient or distracted and totally at fault for killing and injuring innocent people? If so, the driver and tour bus company are probably getting the snot sued out of them. Did the driver have a heart attack? Did the bus brakes fail? I don't know if any of the critically injured people have recovered or died. How many lives were forever changed by this event? I wonder if any of the impatient residents who heard about the wreck, or even people who were directly inconvenienced by it (the highway was closed for at least 8 hours), learned anything from it -- or do they still drive too damn fast on that road and take unnecessary risks?? The wreck did not stop us from visiting Portage Valley and Seward with our own 5th-wheel coach two days later (not too bad going southbound early on Sunday morning) but we sure thought about it and could see where it occurred. Even though Jim did his best to be a conscientious RV driver we were still plagued by a few impatient drivers behind us. I don't think they learned anything from that awful wreck! My advice for other Alaska visitors is to definitely check out Turnagain Arm, Portage Valley, and the whole Kenai Peninsula. There are lots of interesting things to see and do. Just don't drive down there from Anchorage on a Friday during the summer! That's the worst day to drive east and south around Turnagain Arm. Ditto for going back toward Anchorage on Sunday, when so many people are heading back home. Weekdays are a little better in both directions. My other advice is for visitors who are actually behind the wheel -- pay close attention to the road, the speed limit, and all other drivers in both directions so you don't get rear-ended, side-swiped, or hit head on. Don't putz along, don't stop or pull off the road suddenly, and if traffic piles up behind you, pull off when it's safe and let them pass. Don't incite road rage either accidentally or intentionally. Next entry: Twin Peaks hike -- great mountain and lake views, plus a mother lode of ripe blueberries!